ये जीना भी कोई जीना है लल्लू ! : Yeh Dosti ? Dynamics of friendship are strange, almost paradoxical at times. Your best friend wants you to listen to him, and wants you to respond with a certain statement or a question or a comment. But when you do that, you are blown away for not being the perfect friend, for not saying the perfect thing to console the troubled soul. Actually, we never appreciate what we have and we take it for granted that we have friends. The words, which you utter to soothe your friend, the very same words hurt him. In the process, we often fail to realize that life is not a book or a movie. Ideal things and relationships don’t exist here. It is hence our biggest fault that we keep on expecting things and people to be perfect. Sometimes i want to be that kid again when the world was an ideal place; comic book heroes were real, excelling in and finishing up the stages of Mario and Contra used to be the ultimate goals, all the families were as happy as the ones in Rajshree movies, my bunch of best friends used to play with me in the evening; when the word ‘problem’ centred around losing the water bottle in school, when the class teacher was the only person we feared, and when the ‘happily ever after’ actually used to exist, at least in our fantasies. The list of such nostalgic musings goes on. As we grow up things begin to complicate. Whenever my 3 year old cousin, Aanchal (who is in my hometown) wants to talk to me over phone, she points to the coffee cup having my picture on it and says, “Bhaiya..! Chaai mein..! Aanchal..! Baat..!”. 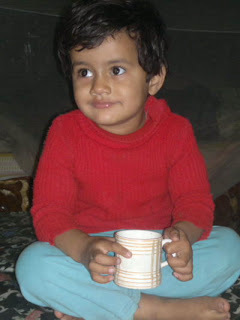 And then her mother corrects her that it is a mug, not “chaai”. She is learning quicker than she ever will in her entire life. And while doing all this, she has helped me understand the meaning of one word, cuteness! Only if life was simple again and we could point out to a coffee mug and say, “Baat..!” And who knows may be if we could open up a little bit more and accept Life as it is. May be, just may be.